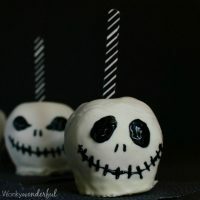 Jack Skellington Chocolate Covered Apples are an easy and impressive Halloween treat! 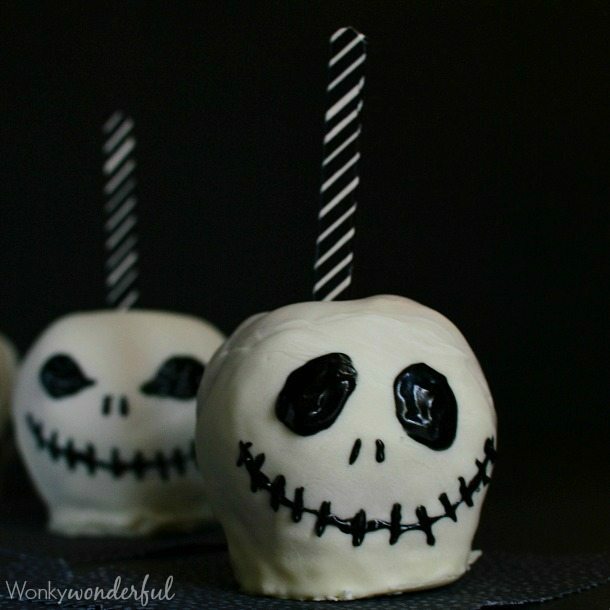 These are a great alternative to a plain candy apples recipe. Especially if any of your friends or family are The Nightmare Before Christmas fans! I had so much fun making these Candy Apples! And honestly, they turned out way better than I expected them to. 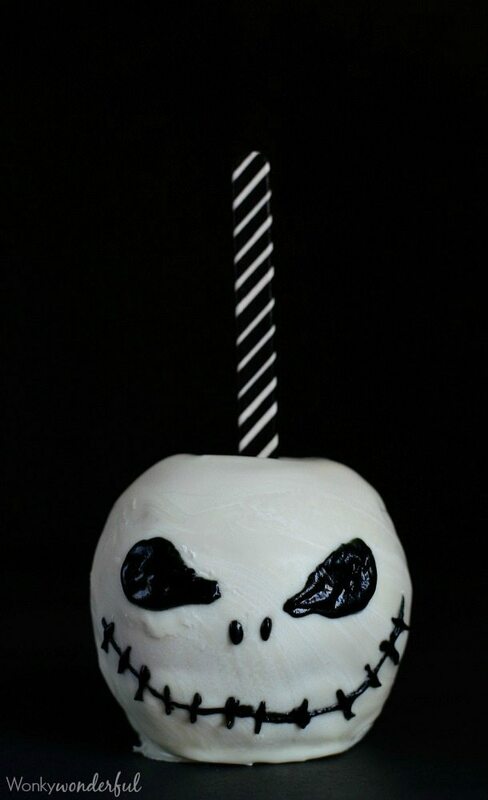 And my daughter about flipped when she saw these Jack Skellington Chocolate Covered Apples! They are quite the unexpected Halloween treat. 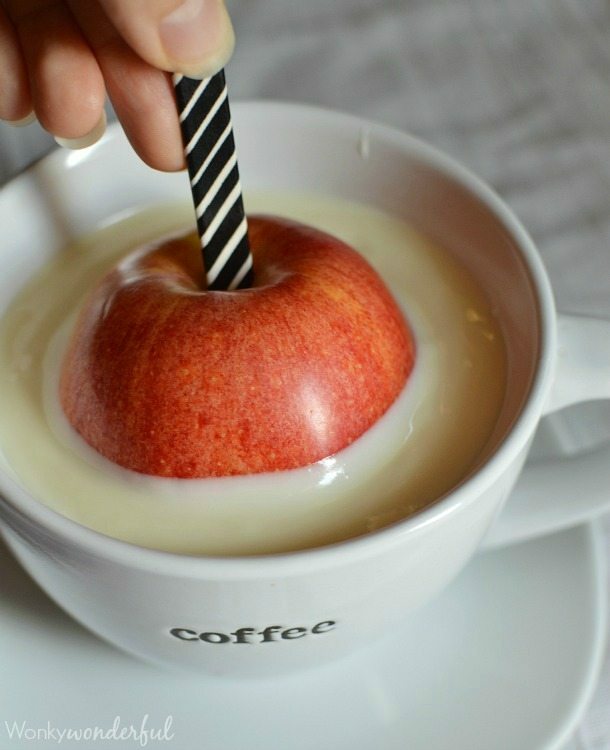 Seriously though, these Chocolate Covered Apples are much simpler to make than they look. I even melt the white chocolate the lazy way, in the microwave. The most difficult step is painting on the Jack Skellington face. And that all depends on your artistic ability. I haven’t painted in years so this step took me longer than I’d like to admit! But it was worth that extra effort. My daughter was beyond thrilled with these Halloween Apples! Of course, it is no surprise. Just look at this year’s Halloween costume that she requested. I originally shared her Jack Skellington costume on Instagram. Any Instagram fans? Check out WonkyWonderful on Instagram for behind the scenes pics! 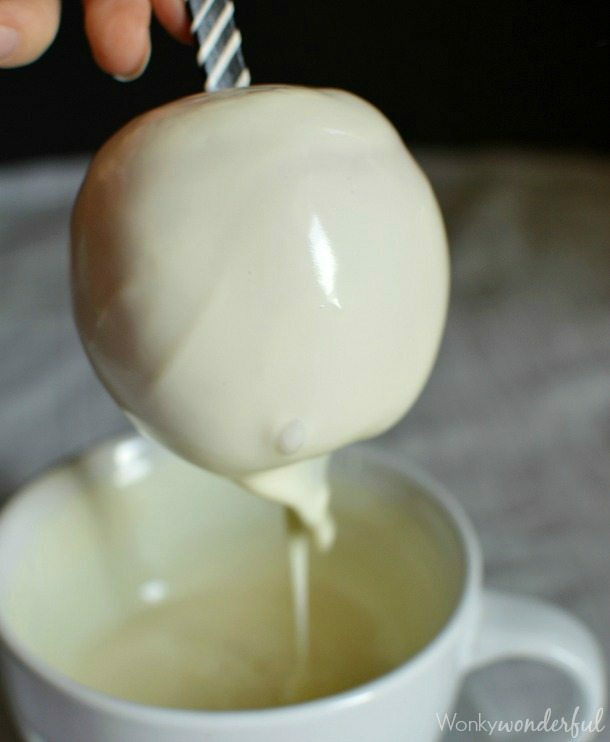 Just melt the white chocolate and coconut oil in microwave. You’ll want to use a dish or cup that is not much wider than your apples and deep enough to fully submerge the apple. Dip and allow the excess to drip off. I also cheated a little with the black frosting. Making dark black frosting can be tricky. So I bought the Wilton premade frosting and it worked great! 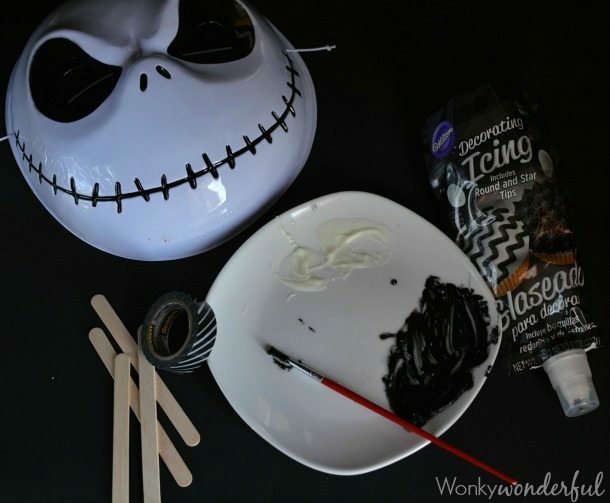 For these Jack Skellington Chocolate Covered Apples you will need popsicle sticks, black & white striped washi tape, a paint brush and a Jack Skellington reference to look at while painting. One important thing I learned for next time: make sure to use a fine tip paint brush! Make Angry Jack or Happy Jack! The Happy Jack with oval eyes is much easier to paint. Cover popsicle sticks with washi tape. Wash and dry apples. Remove stems and insert sticks. Let melted chocolate cool for 2-3 minutes. Once chocolate has fully cooled (5-10 minutes) dip in melted chocolate one more time, repeating process. After second chocolate coating has fully cooled, begin painting the Jack Skellington face. Use a fine tip brush for painting. These are so stinkin awesome!! I love this idea! Thanks Ashley! These were so fun to make! These are so creative! 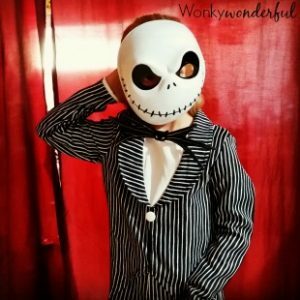 Love that she wanted to be Jack for Halloween. These are so cute. I bet my kids would love them even though they’re older. This is wicked cool. Where can I get Black and White Washi Tape? Hi Donna! I found the black and white washi tape at Target in the Halloween section. I think I can do this… Thanks for sharing Nicole.. I’ll be reading other post later. This is a lovely recipe! So lovely that I just had to include it in my roundup of “Best Halloween Party Desserts” blog post I think guests of any Halloween party will enjoy this dessert so much! Check out the post! I also try to do this… It’s really amazing, and keep sharing. These are SO fun!! I’m not sure my artistic skills are up to the challenge, but I’d be happy to be a taste tester!